Chinese technology company ZTE said late Wednesday it has halted its main operations after U.S. authorities banned it from doing business with American suppliers. "Major operating activities of the company have ceased" as a result of the U.S. Commerce Department "denial order" issued last month, ZTE said in a statement. The Commerce Department slapped ZTE with a seven-year sales ban in a case involving exports of telecom gear to Iran and North Korea. ZTE, which also makes smartphones, had said the ban threatened its existence by cutting off access to U.S. suppliers of key technology and components like microchips. The suspension came amid worsening trade tensions between the U.S. and China centered on technology-related intellectual property, though ZTE's case dates back to before President Donald Trump took office in January 2017. A U.S. delegation traveled to Beijing last week to discuss the brewing trade conflict with their Chinese counterparts. During the meetings, Chinese officials said they also raised their objections to ZTE's punishment with the U.S. team, who they said agreed to report them to Trump. ZTE "maintains sufficient cash and strictly adheres to its commercial obligations subject to compliance with laws and regulations," it said in the statement issued to the Hong Kong stock exchange. "The company and related parties are actively communicating with the relevant U.S. government departments in order to facilitate the modification or reversal of the Denial Order by the U.S. government and forge a positive outcome in the development of the matters." The announcement comes days after ZTE said it had asked the Commerce Department's Bureau of Industry and Security to suspend the ban and had submitted extra information to bolster its case. 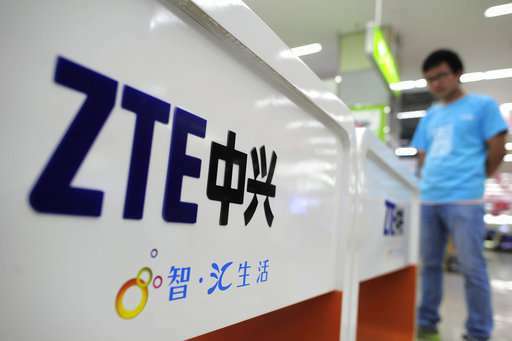 U.S. authorities imposed the penalty after discovering that Shenzhen-based ZTE had misled regulators involving the illegal shipments to North Korea and Iran. The company paid a $1.2 billion fine in the case but failed to discipline employees involved and paid them bonuses instead.